Life and Everything In It: Catch-up Time! Wow, Hard to believe it has been over 2 weeks since my last blog. I must have fallen off the Earth for a while...well just super busy with life and decided that I have needed a few more hours of sleep instead of staying up to those wee hours filling in my entries. I have even been bad at my Journal. Most of my need for more sleep is coming from 2 sources. One is my change of "lifestyle" and the other is lack of "good" sleep! So for the past 2 weeks I have been on a new change of "lifestyle" when it comes to eating food. Not a DIET but a lifestyle change! I have done some research on Glycemic Indexes of foods and have found that the best way for me to lose the extra "baby" weight is to limit the kinds of foods I am eating and choose carefully the foods with the lower Glycemic Indexes, which will keep me fuller for longer and allow me to kick out the fat! I also am going to the gym regularly to help. I have found this to relatively easy because I can eat an assortment of foods, I eat every 2hours or so, don't feel that afternoon CRASH in energy and have lost 7 pounds already! Now please realize this is not an infomercial...I just read up on this and find this to be the easiest way for me to still feel like I am eating tons and loose the weight. I am a total snacker and this helps me to feel less hungry and less like snacking! You can Google Glycemic Indexes to read more. I have been eating chicken, sweet potatoes, green beans, egg whites, any green vegetable, a few different fruits, basically anything that has a GI of 50 or less. On top of this I am not eating breads of any kind or rice or pasta...SO hard to do! This part is only temporary until I lose what I need and then I can add a few things back in in moderation to balance out my blood sugar levels. The trick I have found is that if I keep my blood sugar at an even keel then I have tons of energy and don't feel sluggish! The other thing I learned is that when our bodies make sugar out of carbohydrates (breads, pasta, rice, etc)it releases insulin into our body and then our cells accept what they need. Once the cells have what they need the rest goes to the liver for storage. HERE'S the KEY...Once the liver storage is at compacity, OUR BODIES START TO STORE THE EXCESS INSULIN AS FAT AND PUT IT IN VARIOUS PLACES IN OUR BODY!!!YUCK! Once I realized the way my body handles foods it made it easier to pass up on "BAD" foods for me! Now when I get back to adding new foods again, I can add foods with High GI's but balance them out with protein(low in fat) and lower GI foods and my body takes the high GI's much better...No Crash! Anyway, you can ask me if you are interested in this. It is just so exciting to me to begin to understand just how my body is working!!! Hey and if I lose weight doing it...SUPER! The other reason for my needed extra sleep has been the quality of sleep I am getting! I can fall asleep usually pretty fast but then an hour later I am up and awake and can't go back to sleep for hours and then it starts over again. Weird! Anyway, I figure if I try to give myself some extra hours I can function better. I hope to get in to the doctor this week about this part! For now it is what it is! 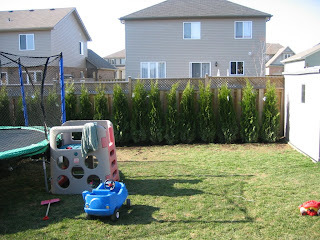 We have been super busy with getting the yard in shape now that the weather has broken and is warming up! 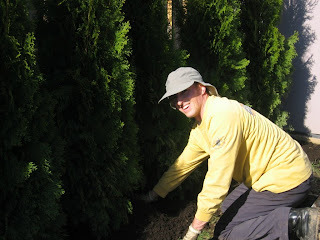 Justin has gotten the landscaping bug and bought cedar trees for our yard (18 of them). He dug a ditch with Ethan across the back yard and yesterday spent the entire day planting them and redoing the garden out front. We will be designing the gardens soon and he has major plans for the back yard but not for a few years...something about a stone patio, cascading gardens...(Too much sun?) I told him to draw it out and we can go from there. I was skeptical about the cedars but now that they are in they look great! He really has an artistic eye! 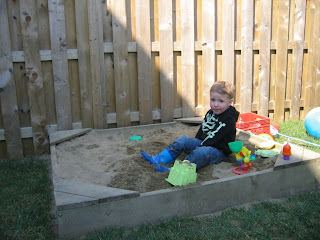 He also put the sandbox in for Ethan and Julie. Ethan has been living in it for the last 2 days! Very fun for the kids! Now it is up to me to clean up all the leftover sand, dirt and clay from the adventure of a new yard! It is all over the house and I vacuumed already once this week! Julie is doing well. Eating a bit more than usual and talking up a storm. She said Mama for the first time on Sunday...very cool however she only has said it once more since then. Justin said he heard her say it earlier last week but wanted me to have my moment! Thanks honey! Ethan is full of fun these days. Also full of attitude. His personality is really coming out. He is very sweet and living to his sisters, most of the time, a cheery guy but has a whiny and pouty phase he is going through! Drives me up the wall and back down again! Every little thing! And the tears that come with the word NO lately! I pick and choose my NO's carefully right now. I also have been trying to keep consistant about any discipline that comes out of the whining. Hopefully he will clue in that when I do say NO it means NO! Soon enough! Emma is doing great at school. Recently she has been doing her responsibilities (jobs) without much fuss. We explained to her that at a real job she earns money and how and how well she does it reflects her wage. She has potential to earn money for whatever she wants if she does her jobs! They are all done each week now at 100%. She also helps out as part of her family for free! That is important too! She is doing something with friends every weekend and enjoys being with us...I think...more too! I am just trying to keep up with life and kids and house and husband, but all is well! We keep striving to be better, kinder, happier and to love each other more! I will post soon about Justin's new adventure to the doctor later. Snip...Snip...Yikes!